Today I have a guest post from a minimalist bullet journaler (the husband). He was interested in bullet journaling, but was overwhelmed with all of the doodles, artistic spreads and elaborate systems that have become standard for many bullet journalers. But he liked the idea of the free form of a bullet journal to track his work and keep him on task and on goal. So he started experimenting with the idea and looking for a way to overcome his fear of bullet journaling, as well as all the intimidation of not being an artist. Below he shares his five biggest tips for getting started bullet journaling when you’re overwhelmed, intimidated or otherwise worried about getting started bullet journaling. They’re solid tips, and I hope they help you too! When in doubt, buy this one from Artist’s Loft at Michael’s, it comes in a variety of colors and types (ruled, quad or dotted, but get the dotted for the traditional bullet journal feel) and right now it’s only 5 bucks. It’s easy to get caught up in a spiral of review and feature comparisons. It can cause analysis paralysis and make you feel like you can’t get started until you have the right journal. But the truth is that until you know how you’re going to use your journal, you won’t know what you need. And that doesn’t happen until you’ve sketched, scratched and messed up a few pages here and there while you work it out. For a similar reason, if you spend 30 dollars or more on a high quality journal, you’ll want everything you put in it to be beautiful. Stunning layouts starting on page one, and the perfect habit tracker that fits all your needs. In reality, this first journal needs to be a scratch pad. You need to try new things, play with your spreads, figure out what works and doesn’t for you. Make the risk of experimenting as low as possible, get a cheap starter journal. Then later you can graduate to something more spectacular. You don’t need to have specific bullets for every possible type of event and note. Maybe later you’ll want sub categories later on, but ease into it. You can always expand your key if needs be. Simple also applies to the form of individual bullets. Dots, slashes, circles and common punctuation are all quick and easy to write. A doodle of a light bulb isn’t. The theme here is to make the journal as easy to use as possible. It should be as simple to write in your journal as it is to send a text. Ideally, even easier. Keeping it simple will keep you working in it, and the more you use it the more helpful it is to you, productivity wise. 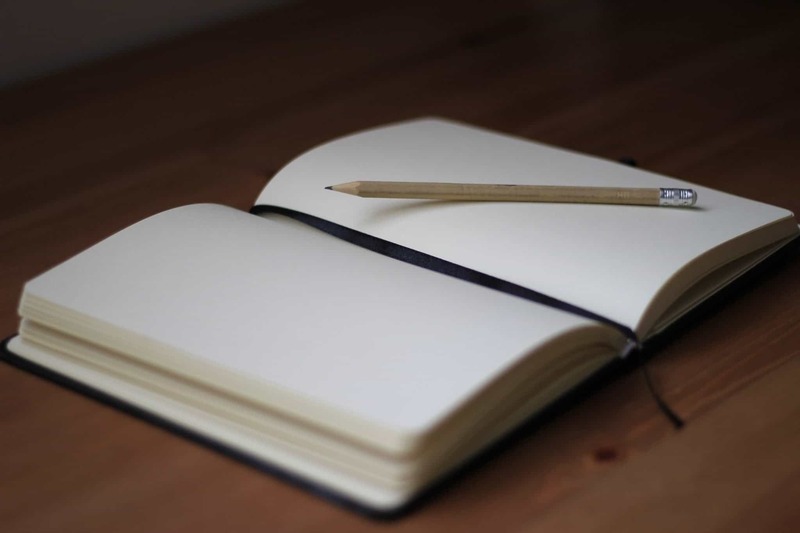 If you feel overwhelmed or like you need a few hours just to set up your journal, you’re less likely to do it. There’s always room to doodle more and add more decorative elements as you go. Your journal can be a reflection of your progress over the year in so many ways, and seeing that progress can be just as gratifying as having a intricately designed bullet journal system. Don’t dive head first into using your journal as a daily planner. Trying to create a spread that allows for hour by hour tracking of your daily activities requires a great deal of thought and foresight to settle on a layout, and then you have to repeat it 6 more times just for this week. If you are just now trying to convince yourself that you would like to start journaling, drawing 30 daily spreads only to decide after day 10 that they’re not working will probably stress you out unnecessarily. This goes the other way to, don’t try to plan a month at a time. You should be experimenting a lot with your weekly spreads at first to decide what you like. There are few things as de-motivating as trying to coerce yourself to draw August’s spread when you barely used June’s and completely forgot about July. It made me put my journal aside all together for awhile. Sticking with weekly spreads while you develop the habit means no empty pages, no big gaps, no big reminders of your absence. 4. Stick to Tasks, Notes and Goals at First. Forget all the spreads, layouts, and other bullet journaling goodness for the moment. I’m sure that people reading to this point wondered how to schedule a meeting 3 weeks in advance with no monthly calendar or future log, the answer is you aren’t doing that yet. At least not until you’ve got the rhythm of your weeks worked out. Trying to turn your journal into a day planner requires the overhead of having the extra keys, forethought and future logs. Tracking tasks is as simple as having a place for your lists. Notes can be jotted down in blocks with tasks. Goals can be a single page at the front of your journal. None of these things require the infrastructure needed for day to day planning. I’ve been actively using my journal for a couple of months now, I’ve added some habit tracking and am customizing my weeks (still very simple) and I love my journal. It has become integral to me staying on task and following through with ideas and goals. That said, I may never use it as a day to day planner. The weekly experiments and lists worked for me and I stuck with them. Most of my meetings are shared via outlook, repetitive appointments are automatic with my google calendar, and the all blended seamlessly and available via app on my phone. Maybe your needs will be different, but starting this way lowers the cost of admission. I know. It sounds silly…but…Of all my tips, this is most useful and applies most generally (and is most obvious). Plan out your content to see if it fits first. Erase your mistakes. Easily remove tasks or appointments that change. Using a pencil removes the burden of perfection. Don’t feel like you have to use a pen to start with just because other people are. You’ll get there when you get there. Now that you’ve started your bullet journal, I have a couple thoughts on how to help you stick with it. Always remember that this is yours alone. Nobody is looking over your shoulder judging your artistry. Nobody is commenting on the messiness of your handwriting or whether or not your lines are straight and even. Your journal does not need to work for everyone, just for you. Remember that! This leads to my second thought, forgive yourself. Are your lines uneven? Is that habit tracker a little wonky? Did you forget last week? Forgive yourself and try to do better in the future. I hope this helps! Maybe you have other suggestions for starting your journal. Share your trials, tribulations, clever solutions and encouragement in the comments!